Wal Mart Free For All A Taste Of Things To Come? In the new story over at Survival Dan called "During The Collapse: Where To Go And What Places To Avoid", he reports that when IT hits the fan, America's 'population hubs' will likely explode with violence, looting and the total breakdown of law and order as resources become next to impossible to get and the masses suddenly realize the government isn't coming to save them. Whether that be via total collapse, WW3 coming home to roost upon US soil or a 'grid event' that leaves tens to hundreds of millions either without power or access to the money in their bank accounts, the video directly below from a Wal Mart in Mexico gives us a very small taste of what that world without law and order can quickly devolve into. Showing what happens when suddenly 'lawless people' realize that there aren't enough security guards in a Wal Mart store to stop them, we witness the kind of all-out 'free for all' that we'll likely see in a collapse event, though the smart people would be carrying out food, toilet paper and other necessities instead of flat screen TV's. And in an all-out SHTF event, we'd expect that the people will likely be fighting with each other for the few remaining resources as they are now in Venezuela where children are literally starving to death. Much more below including a warning from Alt Market's Brandon Smith that 'a full spectrum crisis is about to take place' and more signs that what we're witnessing in Venezuela may be coming to America. We also take a look at several different important maps which show us where we don't want to be in full-scale SHTF but first, a Wal Mart in Mexico gives us a small glimpse of what might happen here once it all comes crashing down. As commenters on the live leak video clearly point out, we've already witnessed events in America similar to what happened in the video above with packs of roving gangs showing up in malls and convenience stores 'en masse', taking whatever they want and parading out as if laws don't matter to them. 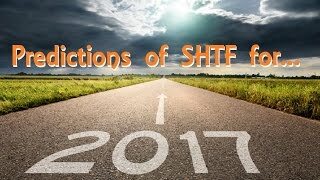 Knowing such events are already taking place in 2017 America, how much worse might things get when SHTF? As Susan Duclos reported this morning on ANP, parts of America are already a boiling cauldron read to boil over. How many Americans are the frogs in the simmering water? In this December 2016 story on ANP called "Map Shows Us Where We Don't Want To Be When It All Turns Ugly", we reported that nearly 50% of Americans live in very small geographical locations. According to this story from the Daily Mail, half of the US population live within 146 counties while the other 157 million are scattered across the other 3,000+. The map seen directly below gives us a visual representation of what that looks like with the counties seen below in blue making up approx. 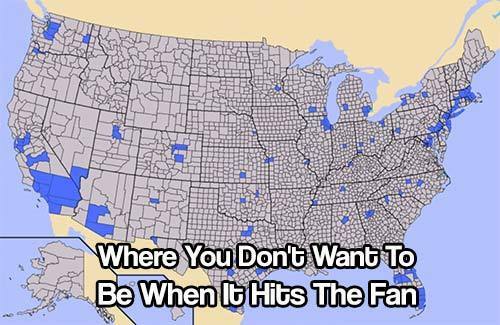 50% of the US population while the remaining 50% of Americans live across the rest of the country in counties seen in gray. When SHTF, does anyone want to be in the blue areas? 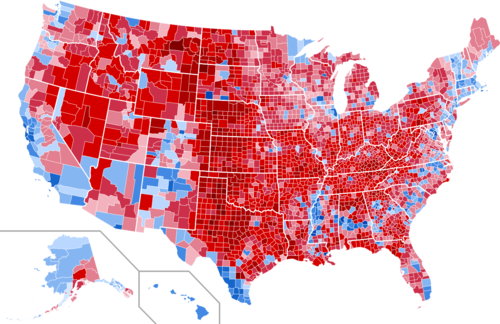 As we also reported back in December, the map seen above showing the US counties with the biggest populations coincides quite eerily with the map of US counties won by Hillary Clinton during the last election seen below. The next map below from James Wesley Rawles' Survival Blog shows US cities with approx. 100,000 population in yellow circles with the shaded areas surrounding them indicating the distances from those cities with each shaded increment representing approx 40 miles. 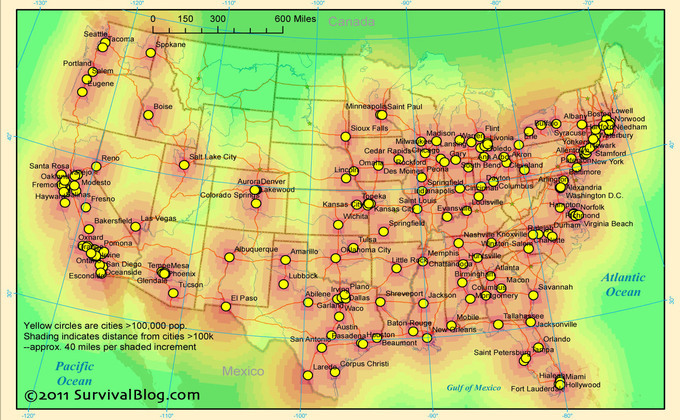 Showing that most of the East coast and eastern half of the US are within 120 miles of big cities, it's easy to understand why videographer The Prepared Mind selects some of the areas seen in the final video below as his 'go to' areas for when SHTF. As M.D. Creekmore over at the Survivalist Blog has previously brought to the attention of preppers, getting out of the cities may not be possible for some who are tied to their jobs when SHTF and many of the same areas mentioned in that videohave such low populations for a very good reason - a major lack of jobs in areas long ago hit by the globalists economy that has decimated much of America. According to Brandon Smith in this recent story over at Alt Market, "I continue to believe that a greater crisis is brewing that is economic and global in nature. With numerous financial bubbles artificially inflated over at least eight years of central bank stimulus, the question is not “if” but WHEN the system will enter the final stages of its ongoing collapse." Smith's warnings echo the warnings given by Doug Casey who recently stated "a civilization always collapses from within. World War 1, in 1914, signaled the start of the long collapse of Western Civilization. Of course, termites were already eating away at the foundations, with the writings of people like Jean-Jacques Rousseau and Karl Marx. It’s been on an accelerating downward path ever since...."
There aren’t any surefire ways to tell if the stock market, and perhaps the rest of the economy, is about to take a nosedive. That’s because millions of people with millions of ideas are involved, so it’s an inherently unpredictable system. However, there are certain players in our economy that have a lot more influence and insider knowledge than the rest of us. So when they make a move in unison, you know there’s a good chance that something is about to go down. And that’s exactly what’s going on with the stock market right now. The people who would stand to lose the most if the markets crashed; the corporate executives and insiders, are all jumping ship and selling their stocks. 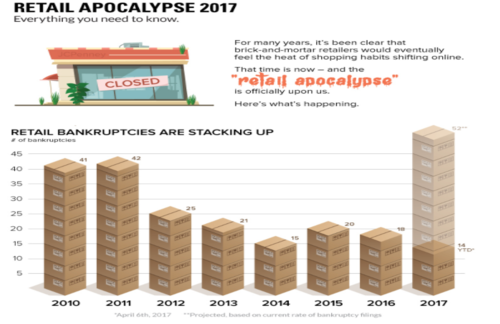 In the midst of all of this is what is described as the “retail apocalypse”, there are two main metrics that are pretty black and white. 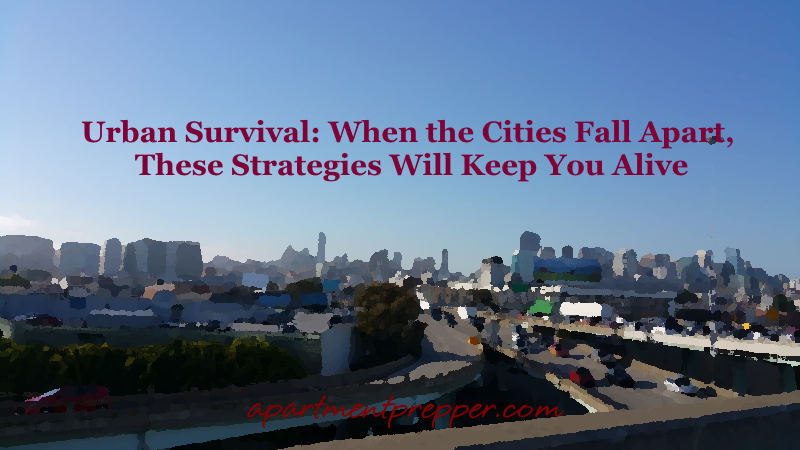 While it is entirely possible to survive in the city, you need to know what you will be up against. I realize that I am painting a very bleak picture, but those who stay behind and choose not to bug out are either under prepared, trapped in the city or have enough skills and know-how to make it on very little stored resources. The latter will not be the majority. Therefore, be prepared for roaming gangs, thugs and desperate individuals who have resorted to a more primal version of themselves. They will do what they need to in order for their needs to be met. If they haven’t eaten in days, they will smell your food from miles away, so you need to know how to mask the smells of your food or you could be welcoming unwanted visitors whose primary focus is to take what you have. Security will be crucial in surviving in an urban setting and having a group you can depend on will make it all the more secure. Many neighbors and friends living in close proximity will band together and help to fortify the homes or find a suitable location in a higher location so you can get a bird’s-eye view of the scenery. One aspect that the city offers is a plethora of building materials to use for fortifying a home. If you start looking for fortifying plans now, you will have a better idea on what materials you will need. I also cannot stress how important it is to have a means of protecting yourself. If someone kicks in your door, they aren’t only looking for a cup of sugar. Having a firearm and knowing how to use it could make all the difference in the world. As well, having a keen grasp on communication skills with your group to ensure your perimeter is safe and make sure you will have alerts to possible threats. Communication is key and you should have multiple forms of communication, especially if a family or group member ends up being separated. One of the greatest threats we all face in cities are terrorist attacks. They target highly populated cities with dirty bombs and chemical weapons, and what we saw in Brussels that is can happen in peaceful cities, as well. Today it was Brussels. Where will it be the next time they hit America? Protecting yourself is the only option to ensuring your family has what it needs, including gas masks to gauge against chemical and biological attacks. In this new story from the NY Times they report in Venezuela's chaos, 'the elite' are now playing a high stakes game of survival with their decisions on whether or not they should continue to support Venezuelan president Nicholas Maduro. If they continue to support Maduro and he's brought down, there's a very good chance they could go down with him. However, if they abandon him and Maduro's dictatorship marches on, those 'elite' who abandoned him may have to pay with their lives if history once again repeats itself. Meanwhile over at Zero Hedge today they report that Venezuela may have reached the inflection point as many members of the military are defecting and have begun to march with the protesters. As has previously been reported, members of the Venezuelan military and police forces have been seen 'dumpster diving' for food, along with the general population. Proving to us once again that food is being used as a weapon as it has throughout history, what is happening in Venezuela and in retail establishments throughout America should be watched very closely in the weeks and months ahead. Watching such signposts also hopefully gives time to those who haven't yet prepared for what we pray never comes to America. The next two videos below include more new footage out of Venezuela, a country that Americans can learn great lessons from, while the 3rd video below features Rob Kirby along with Dave from the X22Report in which they discuss, among other things, the US dollar's declining roll as the world's reserve currency and what that might mean for Americans and the system we live within as the world moves full-steam and dangerously ahead in 2017.